Duke big man Marvin Bagley III is expected to be one of the top picks in the NBA Draft. Bagley spoke to Business Insider about adjusting to the modern NBA, the draft process, and his off-court interests. 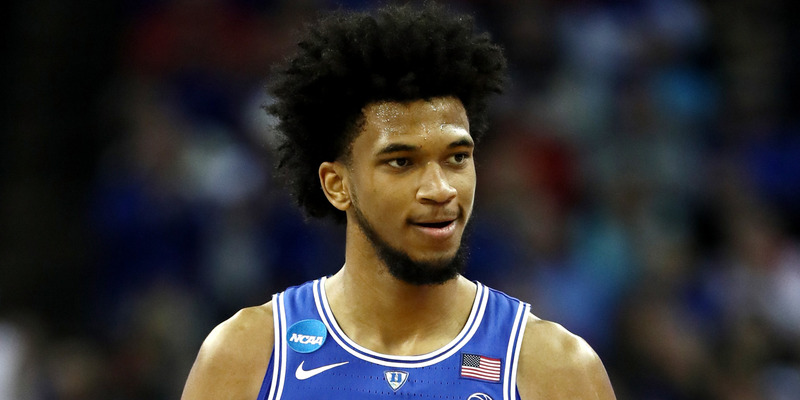 Duke big man Marvin Bagley III is expected to hear his name called early on Thursday at the NBA Draft. Rumours suggest Bagley is likely to be taken with the second pick to the Sacramento Kings. Bagley is a skilled, classic big man, with a variety of moves around the basket and the ability to face up and hit the midrange jumper. There are concerns about his ability to adjust to the modern NBA, in which big men are often asked to shoot three-pointers, defend the rim, and switch onto smaller, quicker opponents. Bagley, however, isn’t worried about any of it. Speaking to Business Insider from St. Nicholas Park in Harlem, New York, to promote his partnership with Mountain Dew, Bagley explained why he isn’t worried about anything – from where he’ll be drafted, who he’ll face on the court, and what role he’ll have to fill. Scott Davis: Is there a Duke player you want to play most next year? Davis: Anyone in the NBA you’re most excited to face? Davis: Is there anyone in the NBA you compare your game to most? Davis: Do you have any plans for what you’ll do on the road? Some people say the NBA can be a little boring. Davis: Are you a gamer at all? Davis: Everyone talks about the evolving role of the big man in the NBA. Do you see yourself as a 4 or 5? Can you plan to fit into the kind of position-less style of basketball that’s played today? Davis: Do you have any aspect of your game you plan on working on most going into your rookie year? Davis: Did you watch the playoffs this year? There was so much switching on defence that some people say the post-up is very important again because teams have to take advantage of mismatches. What are your thoughts on that and do you think you can take advantage of that? Davis: Do you think about what city you’ll land in during the draft? Do you pay attention to the reports and rumours? Davis: Does market size matter to you? You have a lot of off-court interests and business projects. Do the size and market affect your thinking at all about what you want to do off the court? Davis: What should people know about your shoe with PUMA? Davis: Are there any athletes you look up to from a business standpoint? Guys you want to emulate off the court? Davis: What drew you to Mountain Dew?